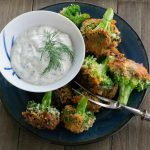 Dippin Crunchy Broccoli Bites - What the Forks for Dinner? Dippin Crunchy Broccoli Bites - What the Forks for Dinner? Cut florets from broccoli bunch making sure you have a stem on each floret. One you can no longer cut florets with a stem save the remainder of the broccoli for another use. In a medium bowl mix the flour panko breadcrumbs, and Italian seasoning until well combined. Heat oil in a skillet, until hot, about 350* degrees. Dip each floret in the beaten egg mixture then into the flour mixture. Place coated florets in hot oil, standing on the floret so the stem is facing up if possible. Cook until golden brown, about 2-3 minutes, using tongs to turn so all the crumb mixture can brown. If the florets fall over it’s ok. Remove to paper toweling to drain. Serve immediately with Fresh Homemade Buttermilk Ranch Dressing.